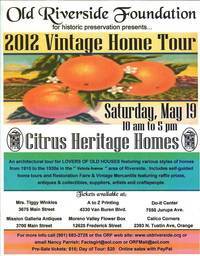 Celebrating Riverside's citrus heritage is the theme of Old Riverside Foundation's 21st annual Vintage Home Tour, which takes place this Saturday, May 19. The self-guided tour showcases four privately owned homes near Victoria Avenue in the city's historic orange greenbelt as well as a downtown church with strong citrus ties. The four homes are the James and Jessie Shaw House (1899), Puffer-Lamar House (1900), Mazzetti Bungalow (1917) and Krinard-Cage House (1925). Each house will contain a docent assisting guests with questions and tour info. As an added bonus, downtown Riverside's Calvary Presbyterian Church will be offering tours of its stained glass sanctuary. The church, which was the family church for citrus canal builder Matthew Gage, is celebrating its 125th anniversary and will have historic photos, documents and a timeline from 1887-1947 on display. A big part of each year's home tour is the "Restoration Faire and Vintage Mercantile" at the Weber House featuring local vendors offering restoration tips and wares. Built by Riverside architect Peter J. Weber, the house -- located at 1510 University Avenue -- is noted for its eclectic architecture (one* | two*) and early eco-friendly designs and serves as headquarters for Old Riverside Foundation. Also on hand at the Weber House will be samples from the recent Fox Theater architectural salvage sale as well as accumulated furniture and Old Riverside Foundation vintage salvage pieces. The self-guided home tour runs from 10:00 a.m. to 5:00 p.m., rain or shine. Tickets are $15 ($20 day of tour) and are available at: www.oldriverside.org. Proceeds will help benefit historic preservation efforts of Old Riverside Foundation. 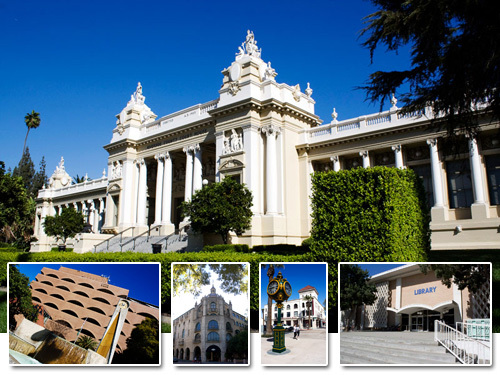 From the eclectic Mission Inn and magnificent County Courthouse to the modern City Hall and mid-century public library, downtown Riverside is rich in architectural history and variety. Fortunately, many of these gems are within walking distance down a few adjoining streets. 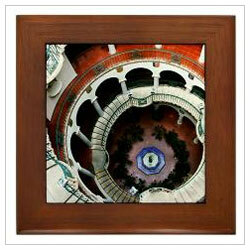 As such, we've created a few short circular, self-guided tours -- Mission Inn Avenue, University Avenue and Main Street. The three tours, which we first produced for ThingsToDoInlandEmpire.com, can easily be completed within 1 to 2 hours each (depending, of course, on how fast you walk). So print out the articles, put on your walking shoes, grab a bottle of water and be sure to bring your camera! 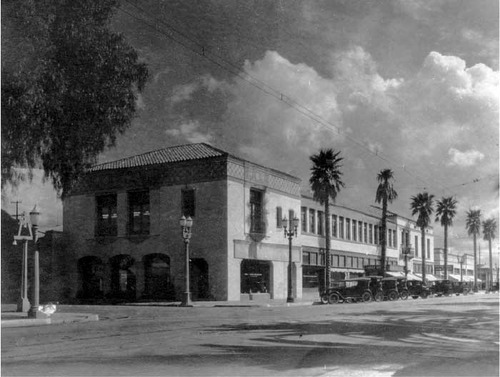 Above is a 1926 photo of the then newly-built Potter Hotel located on the southeast corner of Market Street at Ninth Street in downtown Riverside. Built by Sidney E. Potter of Stahlman and Potter Construction Company, the Potter Hotel was one of several similarly-sized hotels built in downtown during the early 1900s. Its architecture appears to be a mixture of Spanish and Italian Renaissance with a hint of Beaux Arts thrown in for good measure. An excerpt from the book "Riverside in Vintage Postcards," states "it is more like a home than a hotel ... every room [has] a bath, fine light, and ventilation." And indeed, as the postcard to the right suggests, "Air Cooled" was a big selling point for the hotel. Over the years, the building also housed various businesses, beginning with the Citrus Belt Building and Loan Association in 1926 (which may have been an early forerunner to Citrus Belt Savings & Loan). And according to the 1955-56 Criss-Cross directory for Riverside, the building had already been renamed as the White Park Building. Tenants at the time included Watts-Laivell General Insurance and attorneys S. Thomas Bucciarelli, Rex Estudillo (3900 Market), L.B. Mathis Realtor (3910 Market), Fox Beauty Salon (3930 Market), Potter Hotel (3940 Market), David Miller Realtor (3942 Market), First Thrift of California (3944 Market) and Fairman & Company Brokers (3946 Market). By 1967, the building's southern portion had been replaced with a small parking lot (we're uncertain as to when and unclear as to why). Today, the remaining building is still known as White Park Building with Riverside Mission Florist as its primary (and longtime) tenant. 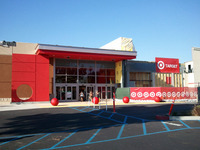 Currently undergoing an extensive remodel, 3333 Arlington Avenue is one of three Riverside locations for retail giant Target. City permits indicate the building was originally built in 1970 for Gemco membership department stores. The value for the original 99,200 square-foot building was listed as $950,000. The architect was listed as Maxwell & Starkman Associates and the contractor as Ernest W. Hahn (who also built Riverside's original Tyler Mall). City permits indicate the adjacent retail strip -- Arlington Square -- on the eastern edge of the Arlington Avenue property was built in 1977. 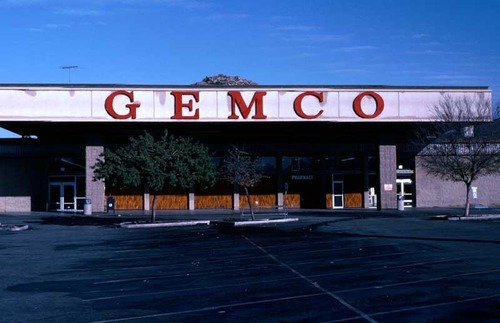 Established in Anaheim in 1959, Gemco was acquired by Lucky (grocery) Stores in 1962, which expanded the chain throughout California, Nevada, Arizona and into Houston, Texas. The company also opened stores under the Memco banner in the Washington D.C. and Chicago areas. In October 1986, Lucky Stores closed its Gemco division, selling 54 of the chain's 80 stores to Dayton-Hudson (Target Corp.). In 1987, Dayton-Hudson used the acquisition of the former Gemco stores -- including the Arlington Avenue building -- to expand its Target chain. The Arlington Avenue Target was the second Riverside location for the Minneapolis-based chain. The first, located at 3520 Tyler Street, opened in 1983 (along with its then sister store, Mervyn's) in the former Treasury discount store building. The third location -- a newly constructed building located at 2755 Canyon Springs Parkway -- opened in 2003. In 1979, a second Gemco location in Riverside opened at 10471 Magnolia Avenue near Tyler Street. A smaller attached building housed various other businesses, including a Nautilus Health Club and an Army-Navy-Air Force recruitment office. After Gemco closed the Magnolia Avenue store, the main building was divided up for use as a Lucky's grocery store and Kids R Us clothing store. More recently, it had remained mostly vacant. A demolition permit was issued in 2008 and, excepting the parking lot and a small strip center at the western edge, the lot remains empty (one | two). Nov. 2011 Update: Remodeling work has finished at the Arlington Avenue store. Besides the addition of a "Fresh Grocery" section, the store has been completely updated and reconfigured. And judging by these swanky ceiling lamps, someone at Target obviously understands the importance of design aesthetics. Also new is a Starbucks Coffee cafe area. View an updated photo gallery. After about three years of planning, renovation and moving, Riverside's Marcy Branch Library has reopened. The new location, near the intersection of Magnolia and Arlington avenues, is about 1 mile from its former spot on Central Avenue near the Riverside Plaza. The relocated Marcy Branch occupies the bottom floor of an 18,000 sq. ft., two-story building on Magnolia Avenue (with the city's Parks, Recreation and Community Services taking the top floor). 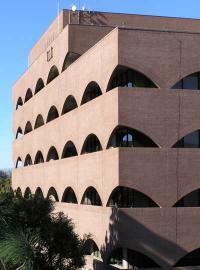 The building was built in 1972 to house district offices for the Automobile Club of Southern California. The architect was well-known Riverside architectural firm, Ruhnau, Evans & Steinmann. The Auto Club remained in the building until 1998 when a new office building opened at 3700 Central Avenue on the site of the former Southern California Gas Co. district headquarters. (Ironically, the new Auto Club building sits directly across the street from the old Marcy Branch library.) Prior to becoming the new Marcy Branch, the former Auto Club building housed offices for Realty Executives (until about 2009). Completely refurbished to the tune of $7.9 million, the new Marcy Branch comprises 9,000 square feet of space (about double the previous location). The roomier location includes over 30 computer stations, WiFi access, a study room, self-checkout stations -- and indoor restrooms (which were located outside at the old branch). The expanded children's section contains an environmentally-themed mural, a story-time gathering area, children's computers, and a life-size "interactive tree" that houses a memory game and puppet theater. Adjacent to the building is a small outdoor area with a bench, grass and shade trees. Directly across the street is tiny, but inviting, Low Park. Still unclear is the fate of the former Marcy Branch, which originally began in 1951 as the Magnolia Center Branch located at Palm School (now Riverside Adult School). In 1958, the branch moved into a newly-constructed building on Central Avenue. The branch was renamed Marcy Branch in honor of longtime Riverside resident Charles F. Marcy whose bequest helped provide funding for the building. Its fanciful, mid-century design by noted Riverside architect Herman O. Ruhnau (of Ruhnau, Evans & Steinmann) includes elements of post and beam construction that was popular during the 1950s and 1960s. At least one proposal calls for the nearby Lucky Greek fast food restaurant -- impacted by the Magnolia Avenue railroad underpass project -- to take up residence in the old Central Avenue library building. Reuse plans may have stalled recently, but whatever the outcome, we hope a viable reuse -- one that doesn't overly damage the original character of the mid-century building -- can be found for the old Marcy Branch. A recent trip to Palm Springs reminded us of that city's sizable collection of mid-century modern architecture, including the former Coachella Valley Savings & Loan building pictured above. 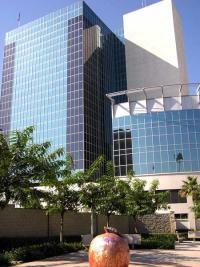 Designed by E. Stewart Williams, the building is an excellent example of modern bank design from the 1960s. We'll explore some of these desert gems at a later date. But the two-day visit also reminded us of a number of modern gems closer to home as well, a few of which we will share now. 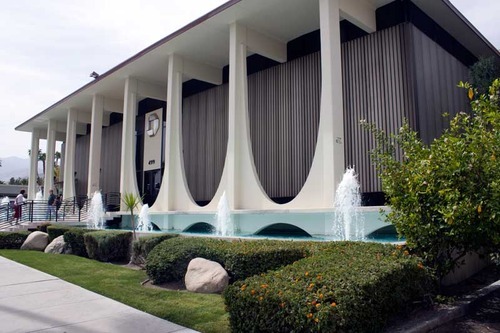 As with the Coachella Valley Savings & Loan, the Riverside library's "floating" walkway, large overhang, symmetrical "screens" and rigid, box-like appearance are all trademarks of mid-century modern architecture. 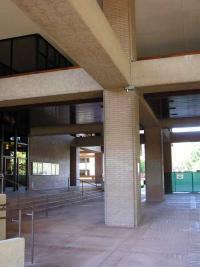 Both buildings are in the vein of the New Formalism style of modern architecture, which was popular for public, institutional and financial buildings during the 1960s. Elsewhere, one of the Inland region's best mid-century office buildings can be found in downtown San Bernardino. Built for the State of California in 1966, the 303 Building housed state offices for over 30 years until a new building opened a few blocks away in 1998. In 2007, after sitting vacant for several years, the building reopened following a $25 million renovation by the County of San Bernardino. The refurbishment included removal of asbestos and lead paint, but the building's exterior retained its mid-century designs, including the slender vertical screens. Another local gem is Provident Bank in downtown Redlands. Designed by Riverside architect Clinton Marr, the building's tall, rigid walls project strength and security -- an architectural trait sought by banks during the mid-century era. Its undulating, rippled roofline adds a futuristic touch to the structure. Though certainly not as prevalent as in Palm Springs, the local region does have its fair share of modern residences, with the majority of these found in Redlands and Riverside. The region also has a number of mid-century churches, including the fanciful chapel at Wesley United Methodist Church located on Arlington Avenue in Riverside. Another Clinton Marr design, the 1959/60 hat-box looking chapel was built using "a thin shell form finished in gunited concrete." Finally, one of the best collections of local modern architecture can be found at UC Riverside, where several buildings were constructed during the 1950s and 1960s. Of particular interest are the Rivera Library, Olmsted Hall and University Theater buildings, each unified via the use of an archway motif. Also noteworthy at UCR is the 161-foot-tall Carillon Tower. Designed by the firm of A. Quincy Jones and Frederick E. Emmons -- one of America's best-known modern architectural firms -- the 48-bell carillon was officially dedicated in October 1966. We hope to explore these and others modern gems in more detail in the coming months. As usual, be sure to use the comment section to tell us of your own favorite modern building(s) scattered about Inland Southern California (particularly those hidden gems we may not know about). 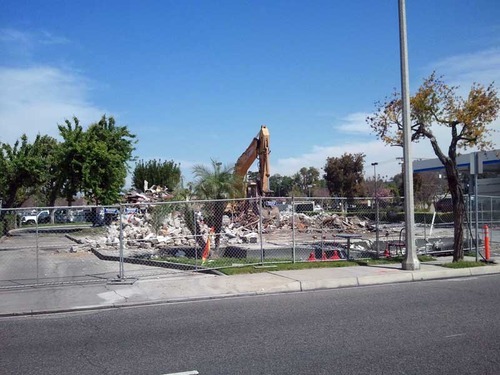 Dating from the late 1960s, one of the oldest Jack in the Box fast food restaurants in Riverside is no more. 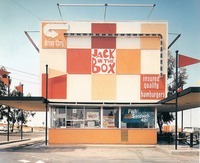 Though certainly not a structure worthy of historic merit, we thought we'd take this opportunity to look back at the whimsical designs of the original Jack in the Box (JITB) restaurants. 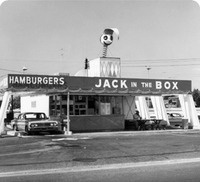 By 1966, the chain had grown to 180 locations, mostly in California and the Southwestern U.S. In 1968, Peterson -- whose Foodmaker, Inc. ran the restaurants -- sold the chain to Ralston Purina Co., who remained the owner until 1985. It was during Ralston Purina's ownership in which "Jack" -- the clown atop the drive-thru menus -- was "blown up" as part of an extensive television campaign in 1980. The makeover was an effort to broaden the chain's appeal with adults. In 1994, after several years in isolation, "Jack" returned as the chain's spokesperson during the "Jack's back" advertising campaign, a role he retains to this day. Back to the two oldest Riverside locations. The city's planning database indicates permits for 3521 Central Avenue (near the Riverside Plaza) and 3434 Fourteenth Street (downtown) were issued in 1968. According to the permits, both locations were two stories in height with 1175 and 1776 square feet respectively (though they look to be the same size) and a value of $24,000 each. The architect listed on the permit for the downtown location (and presumably, the Plaza location as well) is Donald D. Goertz. A quick search of the Internet found an American Institute of Architects (AIA) entry for Donald Dean Goertz, who's also listed in the AIA's archives as being a staff architect for Foodmaker, Inc. beginning in 1967. Based upon what we've found, the earlier JITBs offered both walk-up and drive-thru service, but no interior dining. 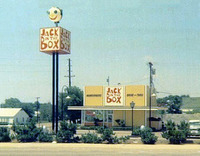 The exterior designs used bright colors and fonts popular during the 1950s and 1960s to emphasize the drive-thru and overall "box" aspect of the JITB name. 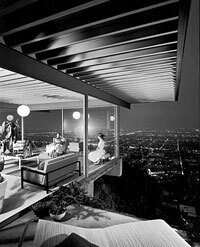 A San Diego website specializing in mid-century architecture lists Russell Forester as the architect for these early designs. We're not clear on whether the two Riverside locations built in 1968 sported these original whimsical designs. It's likely they didn't, primarily due to the different architects used. However, it's possible they may have sported at least some form of the earlier designs -- particularly that of the Mark III concept -- as their current "mansard" look conforms to that found on many early SoCal JITB locations since remodeled (Chula Vista, San Clemente, San Diego). Maybe someone can confirm what the original designs for the two Riverside locations were like? 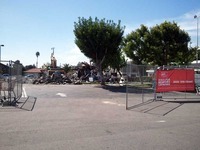 As for the Central Avenue location, we were unable to confirm that a new JITB will replace the now-demolished structure. However, the demolition permit seems to indicate a new JITB is indeed on its way. Browsing the company's website, we found what appears to be the latest prototype (notice the use of "Santee" indicating the restaurant's location -- could this be a future JITB motif?). Update 04/16: Construction of a new JITB is well underway. Update 08/06: The new JITB reopened in late July. Tucked away on a side street off Magnolia Avenue near the Riverside Plaza is the R.P. Small Building, a stylish, mid-century modern building designed by local Riverside architect William Lee Gates. City permits from 1956 show Russell E. Walling as the contractor with an estimated value of $40,000. A quick web search on William Lee Gates finds he was born in 1926 in Portland, Oregon. According to a December 2002 obit in The Press-Enterprise newspaper, Gates served in the U.S. Navy during World War II and Korea. He received his M.A. in Architecture from UC Berkeley in 1952 before running his own practice in Riverside until retiring in 1975. After 29 years in Riverside, he relocated back to Portland in 1986. Gates designed all types of buildings, including residential, commercial, educational and governmental. Among his works locally are the Victoria United Presbyterian Church, 6833 Brockton Avenue and Riverside fire stations #3 (1962), #4 (1962), #7 (1967). He was a member of the American Institute of Architects (A.I.A.) from 1956-1988. Until recently, one of the Small Building's primary tenants was Salon Siner. According to their Facebook page, Salon Siner had been in the Wall Building since 1964. The salon relocated around the corner at 6056 Magnolia Avenue in early 2010. 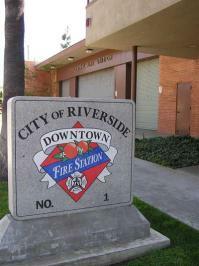 Last month, California's State Historical Resources Commission added Riverside's downtown Central Fire Station to the state's Register of Historic Resources. Entering its sixth decade of operation, plans are underway for a replacement fire station on the block directly behind the current station. We've always had an eye for the building's simplistic, yet unique exterior, which is an excellent example of "form follows function" design. However, it wasn't until recent in-depth research in which our appreciation for the edifice was cemented. Designed by local architect Bolton C. Moise, Jr., the structure came online in 1957 as a replacement for a station* located around the corner at Eighth (University) and Lemon streets. The layout of the new building incorporated the stacking of the dormitory quarters atop the ground-level offices -- while still maintaining immediate access to the engines -- thereby allowing for an adjacent, column-free engine bay* (a necessity for modern fire equipment). The new building also included modern fire communication equipment and updated living amenities. During its early years, the station's design was heralded by city leaders and architects alike. But, as with many Mid-Century Modern buildings, the building has seen its share of indifference over the years as well. Recently, the site has seen at least two mixed-use proposals, both of which included the demolition of the existing fire station. We're unsure as to the current status of the latest plan, which in light of current economic conditions, may have stalled. 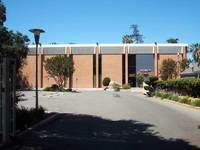 In the midst of planning an expansion for the downtown branch, news surfaced recently regarding the future of another branch within Riverside's library system, this time involving the possible relocation of the tiny, but unique, Marcy Branch. Located on Central Avenue just west of the Riverside Plaza, the Marcy Branch opened in 1958 replacing the temporary Magnolia Center Branch established nearby in late 1951. The branch was named after longtime Riverside resident Charles F. Marcy, whose bequest helped provide funding for the new building. The fanciful design of the circular, single-story library includes elements of post and beam construction that was popular at the time and is yet another fine example of mid-century architecture by noted Riverside architect Herman O. Ruhnau. The interior looks to be mostly intact, including what appears to be original lighting above the central reference desk. The relocation proposal shifts the contents of the Marcy Branch into the former Auto Club building located about a mile away near the intersection of Magnolia and Arlington avenues. The plan calls for the library to occupy the first floor of the two-story, 18,000 sq. ft. building while city officials say offices for the city's Parks Department could occupy the second level. Overall, we like the relocation plan. There's no doubt the Marcy Branch is severely cramped. The proposed move would nearly double the floor space over the existing Central Avenue location and even allow the possibility for future expansion upstairs. But what's to become of the current Marcy building? That's a question not yet answered. Although easy to overlook and under appreciate in its current setting, we feel the existing Marcy building deserves to be preserved. Surely, the city can find an internal use for it, one that doesn't entail significant modification or costs. In fact, one such possibility comes from our friend Tanya at ModernRiverside.com. She has an excellent idea for reusing the Marcy building to house the library's Local History Resource Center, which is currently located in the basement of the downtown branch. Not only would this save the iconic Ruhnau-designed building, it would also allow greater access to more of the library's extensive local history collection. Last month, one of Southern California's notable post-modern architects, Herman O. Ruhnau, passed away at the age of 93 in Riverside, a city in which he left a distinctive architectural legacy. A German by descent, Mr. Ruhnau was born Sept. 1, 1912, in Santa Barbara, eventually moving with his family to Pasadena before permanently relocating to Riverside. Ruhnau studied architecture at USC and served as an architect in the Navy during World War II, returning to Riverside following the war. 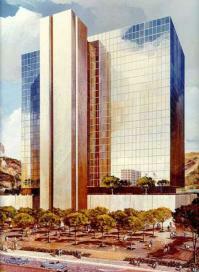 When architect Herman Ruhnau was commissioned to design a new City Hall for Riverside in the early 1970s, his initial vision was of a sleek white concrete and recessed-glass building whose six-stories rose like alternating layers of vanilla cake with chocolate filling. "Then we heard the cry: 'We want arches.'" 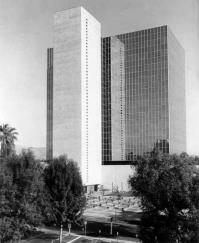 (On Riverside County Administrative Center) ...initial plans drafted in the mid-1960s called for an eight- to 10-story concrete and steel vertically striped tower on a solid two-story concrete base. But before the tower could be erected...Ruhnau says county officials asked for an additional two or three stories. "We had only designed the foundation to hold 10 stories," he explains, "and the only way we could add the extra space was to redo the foundation, which was impossible, or to find some light building material that the foundation could hold." Mirrored glass became the answer. Ruhnau's firm specialized in public buildings and built numerous schools throughout Inland Southern California, including La Sierra High School (1969), Norte Vista High School and Sherman Indian High School, all in Riverside. 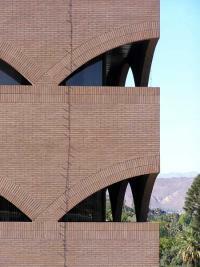 Ruhnau also designed the city's Marcy Branch Library (1958) and worked on the designs for Corona Naval Hospital in Norco. Probably the most unique feature designed by the firm for Riverside that remains today is the downtown Main Street pedestrian mall (1966). Designed in response to the suburban exodus of retailers for large shopping malls -- including Riverside Plaza (1956) -- the pedestrian mall is making a comeback today as both residents, retailers and businesses alike rediscover its uniqueness and charm in the heart of downtown Riverside. The non-vehicular, park-like mall stretches for 7 city blocks (Tenth to Third streets) with only one interruption (Fifth to Sixth streets) and one yet to be fully developed portion (Fourth to Third streets). 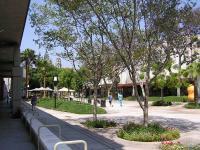 Major anchors along the mall include the Mission Inn, California Tower, UCR/CMP, UCR/Culver Arts Center, Riverside Marriott as well as two civic buildings: Raincross Square Convention Center and the aforementioned City Hall. Although a number of similar pedestrian malls were created as a response to the suburban phenomenon that deserted many downtowns during the post-war years, only a handful remain intact today, something residents and city leaders alike should remember when major changes are proposed. In 1974, Mr. Ruhnau was inducted into the College of Fellows of the American Institute of Architects. He received a lifetime achievement award from the Inland Chapter of the AIA this past April.